I’m getting old. There, I said it! And because I’m getting old I have trouble remembering things. 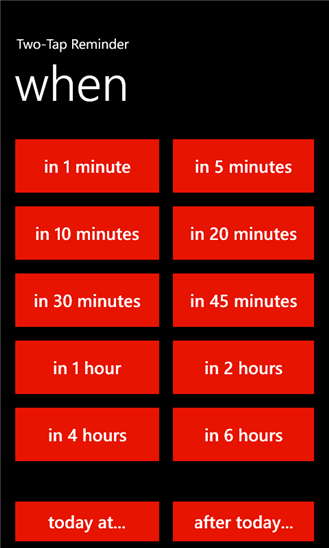 I have begun making use of various calendar and alarm apps to help me remember to do things or not do things that are important…and sometimes not so important. 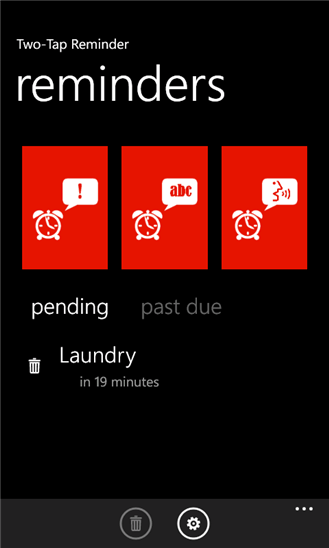 Two-Tap Reminder for Windows Phone 8 is a cool little app that helps those out there who are like me. 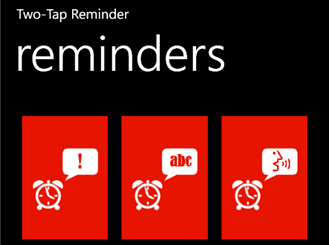 Two-Tap Reminder is a fairly simple no frills app which makes it easy to add a new reminder. 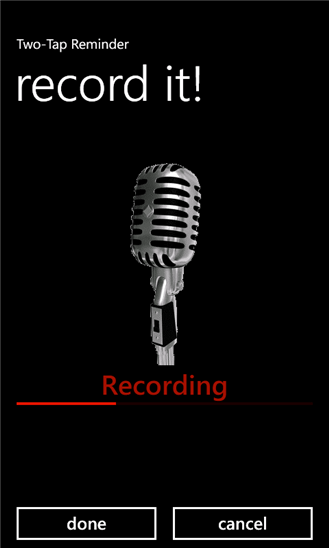 One of the cool features I see with Two-Tap Reminder is the ability to record your own voice for the reminder. So I could record myself saying “Don’t forget to pick up those papers from work or your wife will make you sleep on the couch tonight”. This reminds me not only of what needs doing but also the reason and consequences of failure. 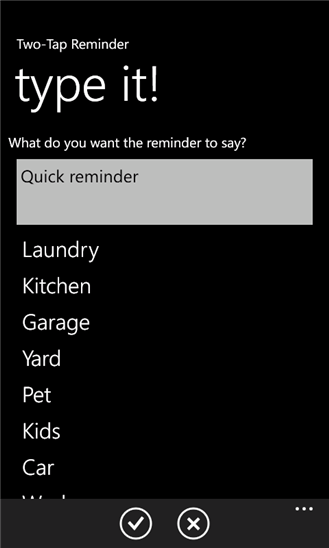 Two-Tap Reminder also lets you use voice commands to add a new reminder. 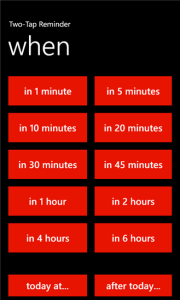 You could say “Two-tap remind me about football game at 4 o’clock”. 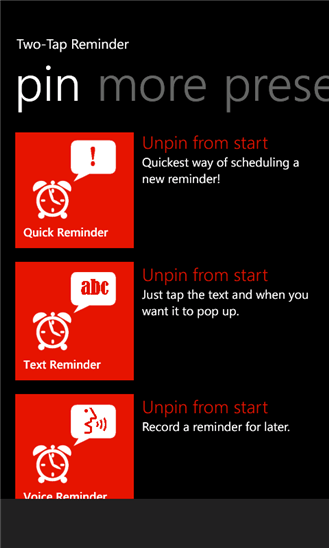 If you’d rather not talk to your phone you can easily add a reminder in just two taps (hence the name). 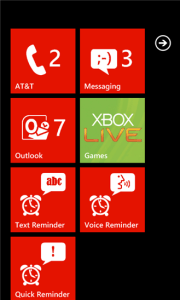 You can use preset time options or use the calendar. 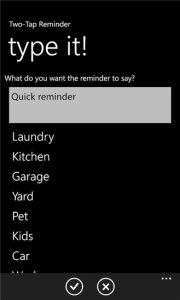 For an additional tap you can add a title to the reminder. Two-Tap Reminder for Windows Phone 8 doesn’t aim to be the next beautiful reminder app with color coding and fancy graphics. 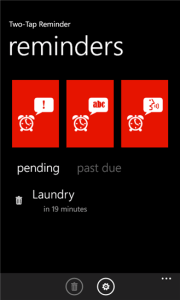 But it does make it easy to add reminders and it actually reminds you…novel concept. 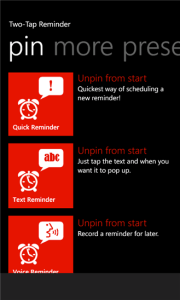 A good basic app with a couple of neat features added in.